Great size for 4 friends to stay and fab having 2 bathrooms. Spacious accommodation with great facilities in a truly excellent location. Flat was amazing & the location was perfect. Everything was literally round the corner. Considering the price of the flat, I would recommend it to everyone. The apartment was absolutely massive, more than enough room for 6 people. The beds were super comfortable. The living area had a large sofa, as well as a large table and chairs for us all to use. The property is a 5 minute walk away from the Old Town Square and the Astronomical Clock so its very central. Plenty of restaurants and bars around, and the property is within walking distance of all main tourist attractions. Everything about this apartment was excellent!! Right in the old city centre, you can walk to anywhere in Prague. It offers anything you may need during your stay there including kitchen, bathroom and ironing facilities.. and all these in a very good and reasonable price. 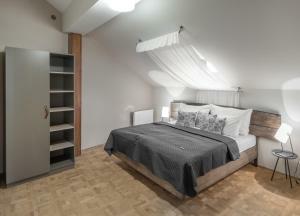 i totally recommend this apartment if you travel to Prague. The location was fantastic, the apartment was clean and a great size fir the two of us. Next day was a great coffee shop and on the corner an artisan brewers. Spacious apartment, with bedroom, large living area with kitchen and large bathroom. 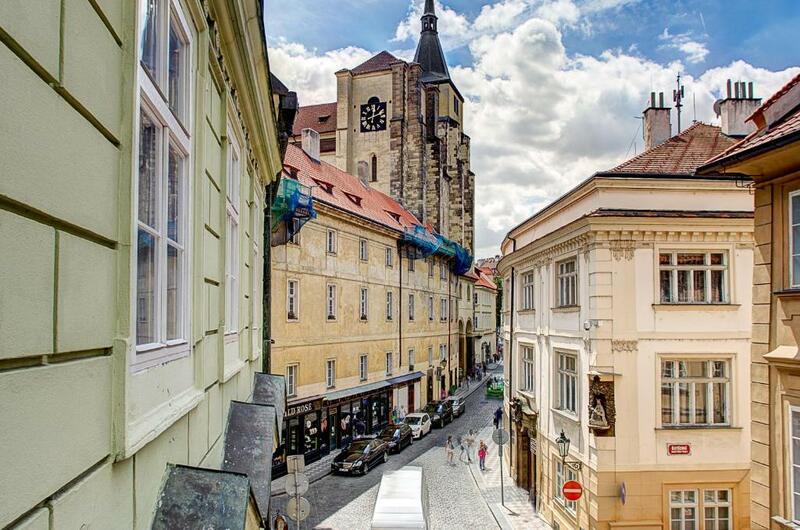 The location is perfect, right in the heart of old Town, 5mins walk to both Charles bridge and Old Square, and about 800mt to the nearest underground stop. Beautiful decor throughout and excellent location for everything in Prague. Comfortable bed and good facilities especially in the kitchen. Lock in a great price for Six Continents - rated 9.1 by recent guests. 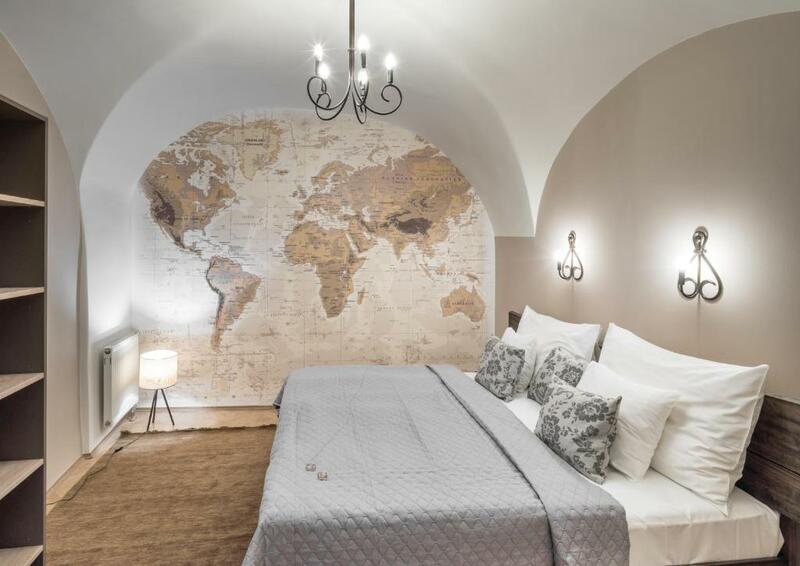 Just 350 yards from the Charles Bridge and the Old Town Square, these elegant apartments in the historical centre of Prague offer free WiFi and fully equipped kitchens with dishwashers. 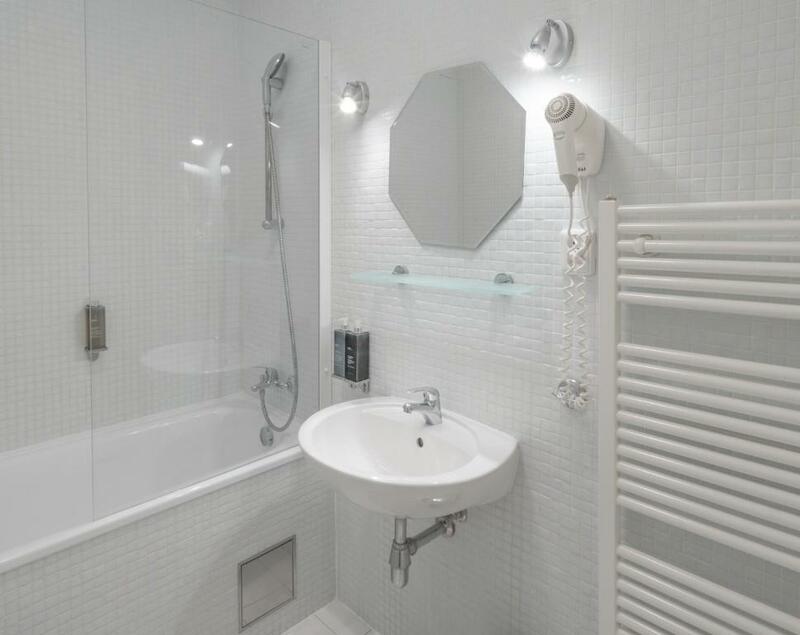 Each apartment provides you with calming bath products. Renovated in November 2017, Six Continents is set in a building from the 14th century and provides bright, non-smoking apartments with stylish wooden floors and soft pastel colour schemes. Each apartment has a living area with flat-screen TV and a dining table. Daily cleaning service is provided. Your non-smoking apartment also has a bathroom with bathtub, bidet and hairdryer. Towels and linen and provided. Within a 2-minute walk of the Six Continents apartments are many bars and restaurants, and the Staromestska Metro Station. The apartments also lie directly on the Royal Route, which leads to Prague Castle. Six Continents has been welcoming Booking.com guests since 1 Sept 2011. When would you like to stay at Six Continents? This spacious apartment, is located on the 3rd floor and can comfortably accommodate up to 6 guests, 2 guests can sleep on a sofa bed in the living room Apartment has two bedrooms, large living room with kitchenette and two bathrooms, both featuring a tub and free toiletries. The apartment is accessible only by stairs. Public parking is possible at a location nearby (reservation is needed) and costs EUR 25 per day. This cozy one bedroom apartment is located on the 1st floor. All windows are facing a quiet courtyard. It has one bedroom, living room with a kitchenette and bathroom featuring a tub and free toiletries. This apartment can accommodate 2 guests in the bedroom and other 2 guests can sleep comfortably on the pull out sofa in the living room. This cozy one bedroom apartment is located on the 2nd floor. All windows are facing the street. It offers one bedroom, large living room with kitchenette and bathroom featuring a tub and free toiletries. This apartment can accommodate 2 guests in the bedroom and other 4 guests can sleep comfortably on two pull out sofas in the living room. 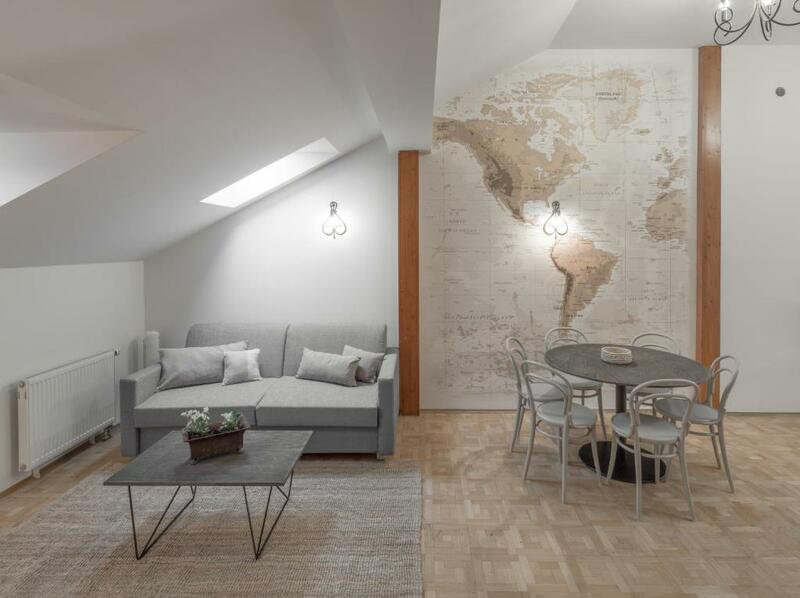 This air-conditioned apartment is situated in the attic and comes with a fireplace, a TV with satellite channels, a safety deposit box, a washing machine and 2 private bathrooms. This large apartment on the 4th floor can comfortably accommodate up to 6 guests, 2 guests can sleep on a sofa bed in the living room. 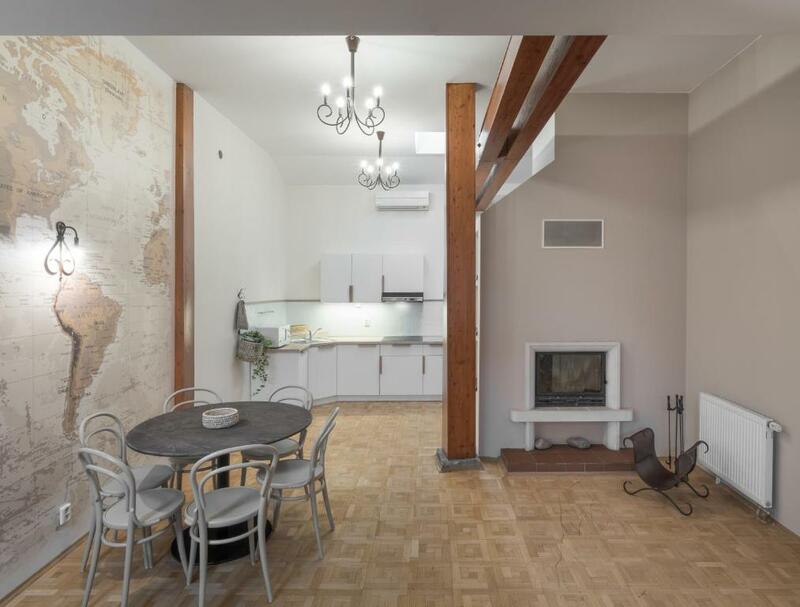 This apartment has two bedrooms, large living space with decorative fireplace, kitchenette and two bathrooms both featuring a tub and free toiletries. This cozy one bedroom apartment is located on the 2nd floor. All windows are facing quiet courtyard, and features a veranda. Apartment has one bedroom, living room with kitchenette and large bathroom featuring a tub and free toiletries. This cozy one bedroom apartment is located on the 1st floor. All windows are facing the street. It offers one bedroom, large living room with kitchenette and bathroom featuring a tub and free toiletries. 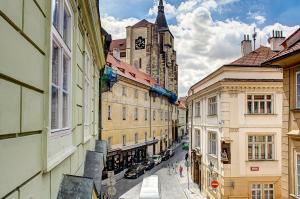 This historical building from 14th century has the best location in the heart of Prague. All of main attractions are in walking distance. 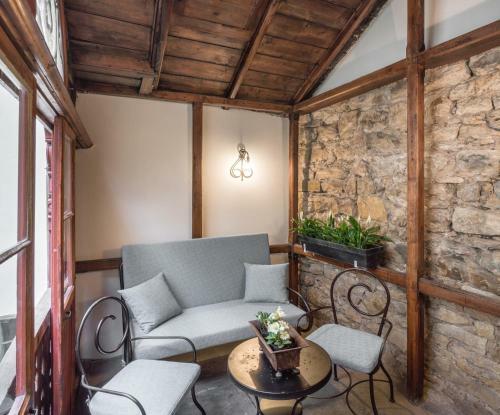 This historical residence is a charming home located in the very heart of Prague only 4 minutes walking distance from both the Old Town Square and the Charles Bridge. It offers 6 quiet apartments in the concept of a Coaching Inn, being the perfect place for travellers from all over the world to relax, providing everything you might need to make your stay perfect. The apartments are accessible only by stairs. We are young team, smiling and always helpful. We prefer personal approach and we do our best to make your stay more memorable. House rules Six Continents takes special requests - add in the next step! Six Continents accepts these cards and reserves the right to temporarily hold an amount prior to arrival. Guests must be quiet between 22:00 and 06:00. Please note that the upper floors are accessible only by stairs. Please note pre-authorisation of your credit card is required to validate your reservation. 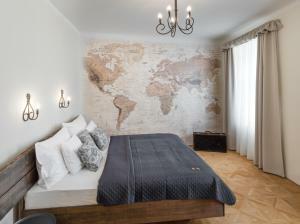 Please note that guests will pay the property in the property's local currency (CZK). The displayed amount (in EUR) is indicative and based on the exchange rate at the time of booking. Please inform Six Continents in advance of your expected arrival time. You can use the Special Requests box when booking, or contact the property directly with the contact details provided in your confirmation. Nothing... the stairs kept us fit! Everything was brilliant. If I was being super picky then there was a can of open lager left in our bathroom upon arrival but it was obviously just forgotten to be gotten rid of. Otherwise it was all fantastic. You couldn’t fault this property, there is nothing that I disliked. Brilliant location in the center of the tourist area not a problem to me as was expecting noise from outdoor but for the grumpy unreasonable type of person they may not like the noise echoing from the busy street outside your window...... Expect noise and appreciate the experience and charm of this great city. Overall appearance of apartment and location. Can’t fault anything. We had a great stay. There was lots of noise from the front door/gate in the night. Hairdryer was useless, extremely difficult to get out of the shower due to the toilets proximity. Very Noisey cleaning team early morning once before even 8am. Thin walls and other travellers staying in six continents not adhereing to quiet hour's. Woken on all three nights by travellers at 2-3am banging doors and shouting up stairwell. Huge shame as the facilities themselves and the location were great. Bedroom, great living areas, facilities, location and reception staff, who were excellent. Apartment is very huge and clean. Location is perfect, It's old town area and most of sightseeings is ( around 1.5 km walking distance ) very close. I like everything. Highly recomended.